I'll make no bones about it. After the Plastic Classic, I was impressed. When we got to the start there was this "new" boat I hadn't seen racing before, #150. "Hey, isn't that Rascal?" Indeed it was, Ralph and his son Richard had come out to have a go at the Perpetual Trophy. "Roy, Ely tells me this guy used to be unbeatable. Says that no one sailing these days could have touched him." At bit later we noticed the sails, "Look at his sails….. Those sails really look good." And then the start; it seemed like 10 minutes into the race Ralph was two or three minutes ahead of everyone. Incredible. But then the boom broke and Rascal II was out of the race. Too bad. So at the Fall dinner I met Ralph and in the course of our conversation he graciously agreed to give me some pointers. We met the next Saturday at the Richmond Yacht Club where he keeps Rascal II. As we were walking along the docks Ralph cautions me, "You have to remember that there's no one way that's right. If there was, everyone would be doing it and all the boats would be the same. There are many solutions, so don't think that what I'm going to show you is the only way." I hope I'm that open minded when I'm 84. Ralph's been sailing a long time. At the dinner he mentioned sailing to the Panama-Pacific Exposition (1915! ), but he spent most of that trip napping, below. (Undoubtedly on the weather side). Climbing aboard Rascal, Ralph pulls out his wallet. In there is an OLD b&w photo of a kid in a period-piece yachting uniform next to an identically dressed man, at a very old spoked ship's wheel; the kind that tilt back towards the stern and you drive from in front. Angle Island's in the background, it's the summer of 1919 and young Ralph is sailing on a 72' schooner with his dad. Rascal's rigging: All the standing rigging coming to the deck is 3/16. Rascal's headstay is 7/32 and fixed in length, no turnbuckle. In the process of getting things just right, Ralph's accumlated five headstays. He prefers the one that rakes the mast aft 7 inches. "To set up mast, put on the headstay and take up the backstay. Then adjust uppers so they're tight and the mast top is centered, as measured by a steel tape brought to the top by the halyard, measuring to the uppers' chain plates. To set lowers, go sailing in a 10-15mph breeze. Adjust the after lowers for a mast that's straight left-right. The mast head will fall off or its center will fall off. Tack and adjust the lee aft lowers appropriately." Jumpers are set up in berth. Their adjustment depends on the mainsail. Mast bend: "the Triton class was not designed to be a bending rig. A slight bend is desirable, however don't overdo it. Several masts have gone over the side because of excessive bending. Keep topmast stay and spreaders in alignment. Excessive misalignment will fold up the spreaders and lose the mast." I gather the mast bend, ending up with a flat sail involves backstay tension, aft and forward lower tension as well as jumper tension. As I walked by I shook Rascal's rigging. Ralph's uppers were tight, his forward and aft shrouds were kind of loose, looser than mine but not as loose as Hulakai's were at the '96 Nationals. Backstay adjustment is a wheel system, like Sleephead's. "I set it up at the dock before a race and ease it when I get back. Never adjust it during a race, not enough time. Much too busy. Races are won on the weather leg, the little we might gain downwind by easing the backstay isn't worth the complexity. I believe in KISS, Keep It Simple, Stupid. The crew should be on the weather rail, not in the cockpit." How much backstay tension do you use? "I don't know, but I screw it down until the bare metal's all gone." (Looked to be about 1-1.25"). Rascal's main halyard is different. It's wire with a ring on the lower end. Ralph raises the main with a line attached to the ring. The ring goes under a hook on the side of the mast, by the main winch. He use the downhaul to adjust the sail. "That means that the gooseneck is on a slide and a lot of people don't like that, and I can see their point. But it works for Rascal. I also have a cunningham which we can use to shape the sail while racing." "The mast step is something I had made up. I moved the mast as far forward as I could and still have it over the mast beam." The mast step is a stainless assembly which has places to attach many blocks including the vang. The vang is a total of 12:1. "The main sheet has this bracket over the companion way which I pioneered." The traveller is pretty simple. Here it is. The rope in the middle allows you to set up the traveller, tack and have the traveller slide to the same position on the other side. KISS. Rascal's traveller. One end of the two part adjusting tackle is fixed to the coaming; a good way to get maximum travel. The line from the car straight down thru the fairlead goes to a cleat (not shown). Once Ralph finds a good traveller setting, this line is cleated, giving the same setting on the other tack. "Now the mast beam's important and Rascal, I think, has the best in the fleet. 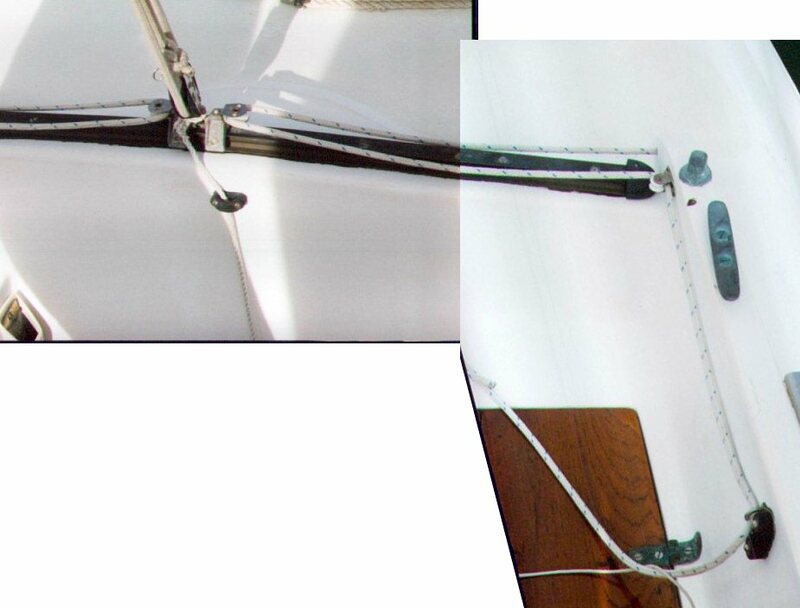 When I first started racing and tightening the backstay I couldn't get the jib to set at all. I finally removed the paint from the original beam and found it had a huge knot in it, just under the mast. So that was just giving and not letting me get good tension. I sailed for a while with a 4x4 and a jack under the mast, but that cracked the watertank which was at the bottom of the post. We fixed the tank, but found the post was a nuisance; always in the way. So I had a piece of 3" steel angle rolled to conform to the crown of the deck under the mast. I made some paper patterns and cut the steel angle so it fits under the mast beam and extends out along the bulkhead almost to the cabin sides. I made a "washer plate", a strip of steel that follows the crown for the other side of the beam. Filled the inside of the angle with epoxy and filler and jacked it up onto the beam, drilled thru the beam along the angle's predrilled holes, thru the washer plate and bolted the thing together. On either side of the door way are vertical wooden beams, epoxied to the bulkhead and running up to the angle iron, to help spread out the load. What's the waterline length of Rascal? The reason I asked is that in my reading I always see the Triton's waterline listed as 20'6". However, our bylaws allow a maximum waterline of 21'6". Are the westcoast boats heavier, or do people just put a lot of weight in to make them stand up better? "Bob Potter, the supervisor at Aero Marine in Sausalito told me that two boats were made with more ballast, Grumpy (96) and Circe (94). They had 21'6" waterlines which is why that's in the rules. Rascal is not quite so extreme." "West coast boats are built better than East Coast. The Sausalito bunch were much better boat builders than Pearson ever was. West coast boats have no balsa in the decks. None. They're pure glass." "I bought Rascal in 1964. It was built in 1960 and when I got it, it was a wreck. The previous owner was an Army Sergeant who used it for fishing. He would motor sail with the sails up. They were flogged to death when I got it. I named her after the R-boat Rascal which Lester Stone built in Oakland in 1922. 1922 was the big year for yachting on the Bay. We'd recovered from the War, the Bird Class got it's start , the first Star Boats, and the R-boat fleet expanded. Rascal was one of four built that year. Lester Stone never designed a homely boat and this was one of his prettiest. All that wood and shiny varnish. So Rascal II, like Rascal I, is named after her." "Let me tell you a bit about the history of Rascal. Her first race was in 1969, at the Perpetual Cup race. We were first by about a 1/2 mile going around the weather mark. However, we went south of Alcatraz thinking it was the faster route. That was the time I learned to always keep between the mark and the competetion, even if the competition seems to be taking the slower route. We got caught in light winds, had to work against a tide, and ended up only 1/2 a boatlength ahead at the next mark. Then I was luffed and bluffed me into dropping out. Shoulda stayed in and fought in the protest room. They had changed the rules that year and his luff wasn't legal anymore." "We really got going in the 70's. Going into the last race of '71 we were one of four boats who could have won. I still remember it, the strangest weather, never saw one like that before or since. I followed Twigga north of Alcatraz to city Front. On the other side of Alcatraz it was dead calm. Hulakai and the others went south. So, Hulakai ended up winning that year." "The next year, 72, we won with the smallest score to date. We won again in '75. Between '71 and '77 we were never more than 1.5 point out of first." "We raced in '83 and won it with a new set of sails. Then my son went to college and I kind of stopped. We raced again in '89 and it was a disaster. We averaged five minutes ahead of the second boat. It really wasn't much fun at all!" "Sailing fast is a lot of little things. For example, the prop aperture on the west coast boats is larger on the bottom than it needs to be. So I filled in the excess area to get it to the minimum. Now you can't tell for sure whether a small thing like that really makes the boat faster. Maybe it makes it slower. But you have to try to do everything you can to make the boat faster." "Sails are so important. The sails I used at the Plastic Classic were the most perfect setting sails I think I ever had on this boat. 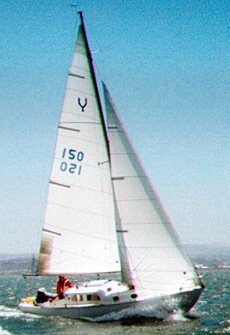 These were the sails I bought in '83 and used again in '89. They've been in storage since then. I worked on those sails to try to get the folds out. I raised the jib at the dock and tried spraying it with water to get out the folds. I laid out the main in my living room. I even tried folding the folds the opposite way to get them out. Fortunately, going down to the South Bay there was a really strong breeze off the Olympic Circle and that ironed 'em out perfectly. Like I said, that day they were the best setting sails I've ever seen. Now I've got my old working jib on, from the '70s, and when I look at it I can't see how it can sail to weather at all! "My racing sails are back in storage, in the basement where it's cool. I'm experimenting with storing them on edge rather than leaving them flat. I suppose I should roll them around large tubes, but…"
Rascal has no instruments. . No depth sounder, no speedo. The compass can be temporarily installed in the companionway when you need it and then put away. "I put in a teak plug where the depth sounder's transducer goes and then faired it up. I never installed a speedo because I noticed that every boat that had one didn't do well. I'm sure they'd both be handy, but KISS." "You can see my clew outhaul. It is internal thru most of the boom." The 4:1 tackle on the boom is the clew outhaul adjustment. The block assembly on the left slides on a track attached to the boom. A wire from this double block enters the boom towards the left end of the photo and goes to a block at the back of the boom. Ralph's vang is a 6:1 tackle pulling on a 2:1 on the boom for a total of 12:1. 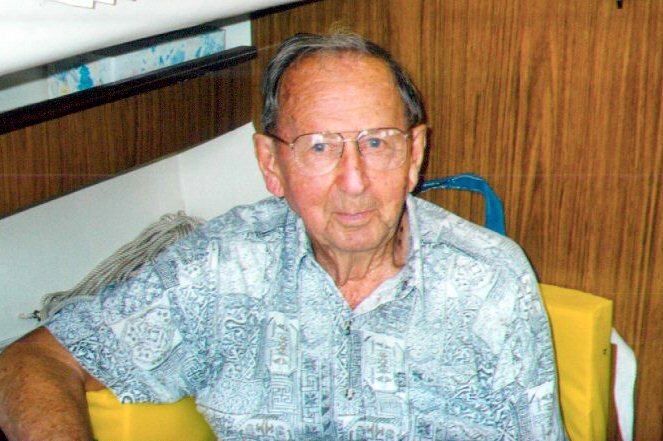 Ralph Beauregard in the cabin of Rascal II. "Go the right way. For example, never go North of Alcatraz on a flood. Work the lee of alcatraz and then go to city front. Go the right way. Do your homework"
"To be good at sailing you have to be a student of sailing. You can't think you know it all. A lot of people think there's nothing left to learn. They don't do all that well."